Remove traffic lines from asphalt – and get the job done quickly! 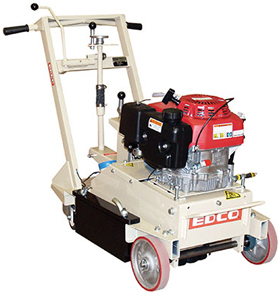 EDCO’s easy-to-use Traffic Line Remover can be pushed or pulled by one person in congested or limited access areas such as city streets, crosswalks and school safety zones. Move the unit side to side for feathered-edge patterns that weather quickly and blend with the undisturbed road surface. 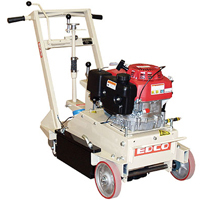 Ideal for removing thermoplastic lines, removing epoxies, and removing paints. 7″ Working width will grind approximately 700-1,000 lineal ft. per hour with EDCO TLR Carbide Cutters. Removes thermoplastic, paint & epoxy traffic markings. Added side-mounted weights supply extra removal pressure. Swivel caster wheels allow side to side motion for feathered edges. Tilt-Top Chassis for safe and easy cutter changes. Separate pressure control lets you adjust grinding pressure to suit changing road conditions.